Mercedes-Benz Canada recently opened a retail space called Mercedes me Markham in the CF Markville shopping centre. MARKHAM, ONT. — Mercedes-Benz Canada and Toyota Canada have tapped into the vast shopping-mall landscape, with each taking a different approach to selling cars alongside department stores and other shops. 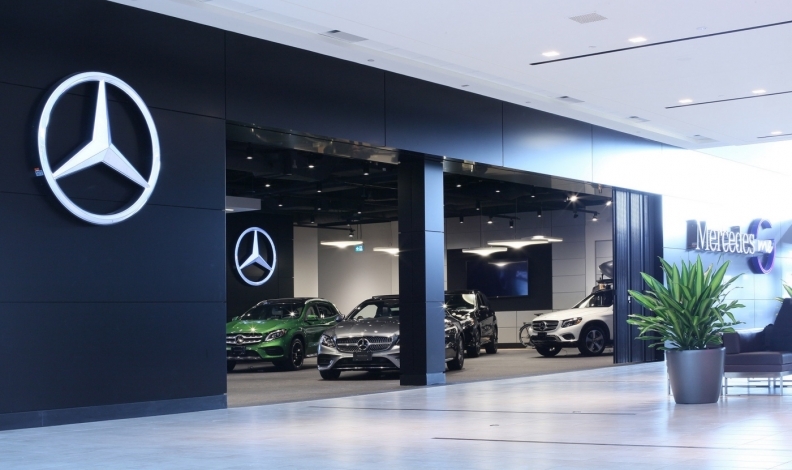 Toronto Retail Operations, made up of seven corporately owned Mercedes-Benz dealerships, recently opened a retail space called Mercedes me Markham in the CF Markville shopping centre. The 5,600-square-foot (520-square-metre) space is a satellite operation of Mercedes-Benz Markham. “This is not a pop-up store, or a short-term presence, or just one or two vehicles sitting in the centre of the mall; this is a whole different concept,” says Philipp Von Witzendorff, vice-president, Toronto Retail Operations, Mercedes-Benz Canada. It has all the trappings of a regular small showroom. The concept is an effort to engage and make an impression with shoppers and non-shoppers alike. “Just browsing” is welcomed and encouraged. If customers want to go forward with a purchase, they are “seamlessly” transferred to the sales department at a dealership, Von Witzendorff said. A visit to the dealership is necessary to complete the transaction, owing to zoning bylaws. If a fully registered dealership’s primary address is the mall (Tesla in Toronto’s Yorkdale Shopping Centre, for example), then it is free to conduct sales, but with trades and deliveries still subject to zoning. The one other Canadian Mercedes me store, in the Aberdeen Mall in Richmond, B.C., is much smaller, and both differ from the six other posh Mercedes me stores in Moscow, Munich, Tokyo, Hong Kong, Milan and Beijing that offer a broader introductory experience, including dining. Toyota's first Towards Tomorrow pilot at Square One mall in Mississauga, Ont., in early 2016. 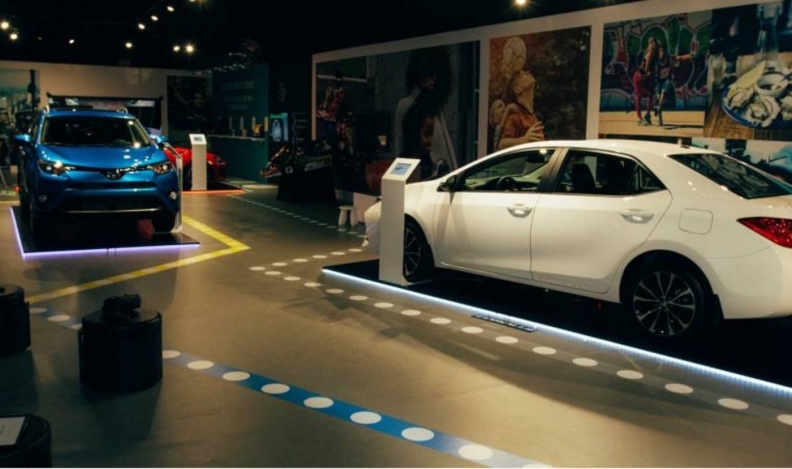 Two years ago, Toyota Canada launched a program called Towards Tomorrow, designed to build brand awareness by establishing a presence in a mall. The first pilot at Square One mall in Mississauga, Ont., in early 2016 lead to further mall appearances in Laval, Que., Richmond Hill, Ont., and Tsawwassen, B.C. Each installation featured virtual-reality experiences, safety-system learning stations, four vehicles, a children’s zone and cell-phone charging stations. “We learned that was a really good way to slow down, and have a conversation with people,” said Jamie Humphries, marketing director for Toyota Canada. Visitors stayed for an average 20 minutes. Younger people might do most of their shopping online, but they are also skeptical about what they see and read online, Humphries said. Dealers also liked the mall tours. “They’re asking that we bring more brand galleries to their markets.” Humphries said. Toyota Canada is assessing where to locate the next phase of mall stops later this year.